Germany produced two widely used bombers that fought on all fronts throughout the war. One was the He-111 and the other was its replacement, the Ju-88. Over 15,000 were built, rivaling it with many other types in terms of numbers built and making it the third most produced German aircraft after the Bf-109 and FW-190. Designed as a high speed bomber with the ability to perform dive bombing missions, the Ju-88A-4 was the third major production variant after the A-1 and A-5 version. Though the Ju-88A-4 entered service during the summer of 1940, it was the A-1 and A-5 subtypes that saw the greatest amount of action during the Battle of Britain. The Ju-88 went on to more subtypes and even a wider array of missions, but it was the early versions that are most remembered by enthusiasts. 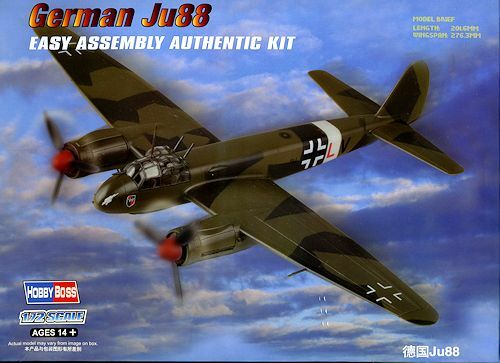 This kit depicts the Ju-88C. The Ju 88C was originally intended as a fighter-bomber and heavy fighter by adding fixed, forward-firing guns to the nose while retaining some bomb carrying ability of the A-series bomber. The C-series had a solid metal nose, and retained the A-series style vertical tail, while omitting the ventral Bola gondola under the crew compartment. It was later used as a night fighter and this became the main role of the Ju 88C. The first night fighter version of the Ju 88 was the C-2, based on the A-1 and armed with one 20 mm MG FF cannon and three 7.92 mm (.312 in) MG 17 machine guns placed in a new metal nose. These examples entered service in Zerstörerstaffel of KG 30 and the unit was renamed II./NJG 1 in July 1940. Some aircraft had bomber noses painted on the nose of the aircraft in an attempt to fool Allied aircraft. It was fairly succesful. The C-6 version was based on the later A-4 airframe. 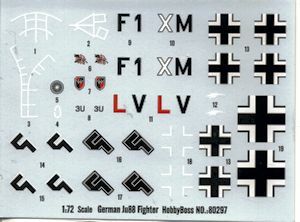 I find it interesting that Hobby Boss chose to model the ground attack version of the Ju-88 instead of the standard bomber. It does make for a nice change from the usual in this regard. As with other Easy Assembly kits, there are not a ton of parts. The fuselage and wings are split into upper and lower sections. The upper section includes the rudder and the lower section includes the tailplanes. There is an interior with a floor, control stick and two seats. Actually the rear seat should be facing aft to man the machine guns and the radios. There are no radios included as is the norm with this sort of kit. The lower engine nacelles are complete with the gear door. Gear is actually well done with separate wheels and oleo scissors. Each of the engines is a separate piece with the exhaust molded in place. Props are a single piece and are paddle bladed with a separate spinner and backing plate. Tail gear fits into a slot in the back and there is an unusual insert that goes between the lower fuselage and the rudder. The cockpit section is a single piece and nicely molded. Rear defensive guns are simply barrels that fit into the appropriate slot. The lower gondola is also a clear piece to facilita te painting. There are no defensive guns in this part, though they may well have not been required. A single piece nose is provided. Markings are provided for two aircraft. 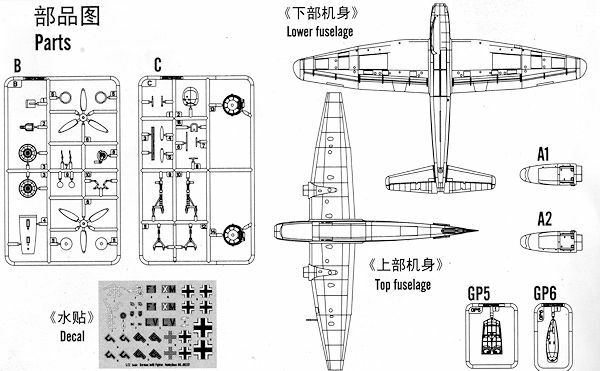 One is the box art plane with 11./ZG 26 in a standard RLM 70/71/65 scheme with white fuselage band and white lower wing tips. The front half of each spinner is red. The other is one with 4(Z)./ZG 76. This aircrft has the upper surface in white with yellow fuselage and lower wing tips. This scheme offers the false clear nose that was mentioned in the history section. The decal sheet is nicely printed and I've not had any issues with Hobby Boss sheets. I am pleased that Hobby Boss is continuing this line of kits. They provide both the new modelers and those who want a hassle-free build a chance to put some nice models on the shelf. Thanks to Squadron Products for the preview kit. You can find this kit at your favorite hobby shop or on-line retailer.